Cyril Garrett Neville (born October 10, 1948) is an American percussionist and vocalist who first came to prominence as a member of his brother Art Neville's funky New Orleans-based band, The Meters. He joined Art in the Neville Brothers band upon the dissolution of the Meters. Neville wrote an article for the December 16, 2005 edition of CounterPunch, titled "Why I'm Not Going Back To New Orleans" and was featured in the 2006 documentary film, New Orleans Music in Exile. After Katrina he moved to Austin, Texas but currently lives in Slidell, Louisiana. Soul Rebels Brass Band featured Neville as a special guest on their Rounder Records debut record, Unlock Your Mind, released on January 31, 2012. The Soul Rebels' name was conceived by Neville at the New Orleans venue Tipitina’s, where the band was opening. In 2005, Neville joined up with Tab Benoit for the Voice of the Wetlands Allstars to bring awareness to Louisiana's rapid loss of wetlands along the Gulf Coast. The band also features Waylon Thibodeaux, Johnny Sansone, Anders Osborne, Monk Boudreaux, George Porter, Jr., Johnny Vidacovich, and Dr. John. The band has become a main feature at the annual New Orleans Jazz & Heritage Festival. In 2010, Neville joined popular New Orleans funk band Galactic. He put aside his solo career to tour internationally with the band. In 2012, Cyril Neville joined forces with Devon Allman (son of Gregg Allman of The Allman Brothers Band), award-winning blues-rock guitarist Mike Zito, bassist Charlie Wooton, and Grammy-winning drummer Yonrico Scott to form Royal Southern Brotherhood, a blues-rock supergroup. As a member of the Neville Brothers, Cyril won the 1989 Grammy Award for Best Pop Instrumental Performance for the song "Healing Chant". In 1996, he and his brothers were nominated for the Grammy Award for Best Pop Performance by a Duo or Group with Vocals for the song "Fire on the Mountain". They were also nominated for the 1999 Grammy Award for Best Traditional R&B Vocal Performance for the album Valence Street. In 2014, Neville (as a solo) was nominated for a Blues Music Award in the 'Contemporary Blues Album of the Year' category for his album Magic Honey. ^ Cyril Neville (2005-12-16). "Why I'm Not Going Back To New Orleans". CounterPunch. Retrieved 2016-09-25. ^ "The Soul Rebels: Unlock Your Mind EPK (Extended)". Youtube.com. Retrieved 7 April 2012. ^ Spera, Keith (May 7, 2011). "Voice of the Wetlands Allstars perform and persuade at New Orleans Jazz Fest". Times-Picayune. New Orleans, LA. Retrieved 29 March 2018. ^ "Cyril Neville & Galactic Together On Tour". crossharpchronicles.wordpress.com. CHC Network. 2010. Retrieved 29 March 2018. ^ Spera, Keith (September 23, 2011). "Texas honky-tonk singer Dale Watson is the real deal". Times-Picayune. New Orleans, LA. Retrieved 29 March 2018. ^ a b Smith, Willimas. "researcher". CHC Network. Retrieved 2014-05-16. ^ a b c "Artist: Cyril Neville". www.grammy.com. Recording Academy. 2018. Retrieved 29 March 2018. ^ "2014 Blues Music Awards Nominees and Winners". Blues.about.com. Retrieved 16 May 2014. 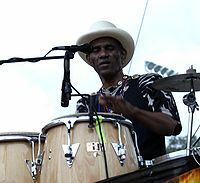 Wikimedia Commons has media related to Cyril Neville.